Are you looking to lose a few pounds quickly? Then GM diet is your answer that provides fast results in just 7 days. The increasing popularity of the GM diet can be attributed to its simplicity and visible results that attracts people to try it out. But because the GM diet is mainly based on fruits and vegetables, so many people face a lack of food option in the GM diet menu. 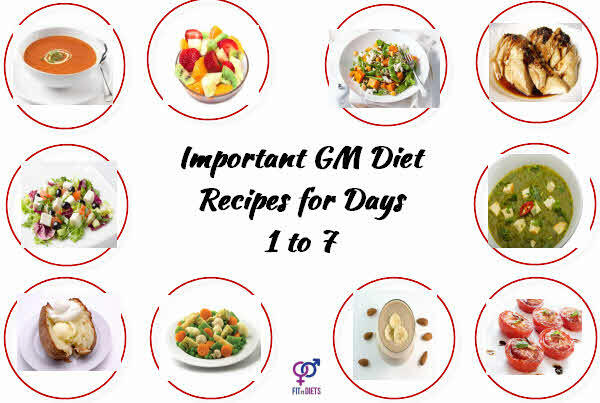 In this article, we have listed not one but eleven useful and effective GM diet recipes starting from the GM diet wonder soup to the boiled chicken and baked fish that can in included in all the 7 days of the diet. This is one of the most important GM diet recipes for day 1 because you are allowed to eat only fruits and water on this day. A consisting of fiber-rich fruits helps to kick start the process of detoxification and flushes out toxins. As there are no restrictions on the quantity of fruits, therefore, you can eat as much as you want. Preparing a fruit salad with a variety of fruits is a great way to cut out the monotony of the restrictive diet. All of the above motioned fruits are allowed in GM diet day 1. Instead of eating them separately, just chop them in bite sized cubes, mix them in a large glass bowl and sprinkle some chat masala and lemon juice from top. Your sweet and tangy fruit salad is ready. You can consume half of the salad at a time and store the other half in the refrigerator for the next meal. This is one of the most important GM diet day 2 recipes and you are suppose to start day 2 with this dish for breakfast. Because the first 4 days of the GM diet are completely devoid of carbohydrates, starting the day with a baked or boiled potato helps to supply a considerable amount of energy to the body and so that you can get through the difficult phase. Wash the potato thoroughly under running water and pat dry with a towel. Now, prick the potato in a few places using a fork. Rub 1/2 table spoon of the butter all over the potato. Heat the oven to 425°F and place it in the baking over rack and bake it for 50 to 60 minutes. Flip it over every 20 minutes to check for doneness by piercing a form in it. Remove from the oven and add the rest of the butter on top of the baked potato. A savory and spicy mixed vegetable salad holds a significant place in the GM diet menu and it can be enjoyed on almost all days of the diet, except on days 1 and 4. A vegetable salad is a delicious and healthy alternative to boiled vegetables and it makes raw vegetables more palatable. Wash all the vegetables, peel and chop them as directed. Put all the vegetables in a large mixing bowl and add the lemon juice, salt, black pepper and cilantro from top. Mix all the ingredients thoroughly and enjoy immediately. Vegetables combined with salt and lemon juice tend to turn soggy if kept for too long. Eating raw vegetables throughout the day can be a bit difficult for most of us. So, here is one of the effective GM diet veg recipes that you can try out in Day 2 of the diet. The streaming process helps to retain all the nutrients and vibrant colors of the vegetables. It also gives a nice crunchy texture to the vegetables which cannot be attained by boiling them. Mixed vegetables is also one of the vital GM diet day 3 recipes. Chop all the vegetables into bite sized pieces and wash thoroughly. Put all the vegetables into the pressure cooker, add the water and put on the lid. Cook for 2 whistles and then carefully release the pressure from the pressure cooker. Open the lid and take out the vegetables in a plate, season with salt and black pepper and enjoy immediately. You are allowed to eat only bananas and milk on day 4 of the GM diet. But this is one of the gm diet day 4 recipes that can add a delicious twist to the otherwise boring food menu. Instead of having the milk and bananas separately, you can combine the two ingredients together in a blender to create a delicious and creamy banana and milk smoothie. This smoothie acts as an instant source of energy that also helps to supply some essential minerals and vitamins to the body. Peel the banana and put it into the blender, next add the milk and ice cubes and blend all the ingredients till the mixture develops a thick and smooth consistency. Make sure there are no lumps or clumps. Pour the smoothie into a tall glass and enjoy with a straw. Tomatoes play an important role in day 5 of the GM diet and you are supposed to eat 4 to 6 tomatoes throughout the day. But gobbling 6 raw tomatoes is not an easy task for many of us. Here is one of the easy gm diet day 5 recipes that helps to solve this problem. Oven roasted tomato retain all the nutrients and makes it even more delicious by enhancing its sweetness. Wash the tomatoes, pat dry with a kitchen towel and set aside. Preheat the oven to 450 degrees. Place the tomatoes on the baking pan or baking sheet, pour the olive oil on the tomatoes, sprinkle some salt and pepper and bake for 40 to 45 minutes. Rotate the pans halfway through to prevent the tomatoes from burning. Take out the roasted tomatoes from the oven, let them cool a bit and enjoy with brown rice. You can start having proteins from day 5 of the GM diet. Boiled chicken acts as a substitute for beef and it can be prepared in a various ways, but you must use minimal amount of oil and spices to keep it healthy and GM diet friendly. This is a slow-cooking chicken recipe that contains the goodness of fresh vegetables as well. Wash the chicken and place it in a deep bottomed pot along with chopped onions, carrots, celery and pepper corns. Add water to it, cover the pot and bring it to a boil. Reduce the head to let it boil till the chicken in perfectly cooked and tender. Now, remove the chicken from the water, sprinkle a pinch of salt and enjoy it with brown rice. Grilled fish is a perfect protein substitute for chicken and ideal for those who don’t eat poultry. It is difficult to get rid of the stinking smell of fish by boiling it, so the next best option is to grill it or bake it. This grilled fish recipe makes minimal use of olive oil which helps to keep it low in calories. It is an extremely versatile recipe and you can use any type of fish for this recipe. Set the oven grill on high heat. Rub the lemon juice generously on both sides of the fillet and then season with salt and pepper flakes. Grease the baking sheet with olive oil and place the fish fillets on the greased side. Cook for 15 minutes or until the fish turns flaky. Enjoy with a plate of fresh salad. Spouts salad form a filling and wholesome snack in GM diet day 6 recipes and it is especially beneficial for those who are vegetarians. The sprouted legumes and beans act as a potent source of protein that helps to fill you up and keeps you satiated till the next meal. You can use your choice of lentils and legumes for prepared the sprouts salad. Boil the sprouts in water till they turn tender. Remove from heat and drain the excess water. Let it cool completely. Next, add the onion, ginger, lemon juice, cucumber, salt, pepper and coriander leaves, mix all the ingredients thoroughly and serve in a snack bowl. Boiled Palak Paneer is a healthy and nutritious recipe for vegetarians who cannot eat chicken, fish or eggs to get their protein requirements. This is one of the key recipes of the vegetarian GM diet plan that can be included in the final days of the diet. It can also be included in the list of GM diet day 7 recipes. Boil the chopped spinach leaves in water till they turn completely mushy. Squeeze out all the water from the boiled spinach. Dry roast the coriander powder, cumin powder and red chilli powder in a tawa and add it to the mashed spinach. Mix well, sprinkle some salt to it and again mix it thoroughly and set aside. Take a non-stick pan and add the olive oil to it, cut the paneer into bite sized cubes and add it to the pan. Let the paneer cubes sear for 3 to 4 minutes or till they develop a light golden hue on all sides. Now, add the mashed spinach mixture to the pan, mix well with the paneer cubes and remove from flame. Serve the Palak paneer with brown rice. So, now that you have all the GM diet recipes at your disposal what are you waiting for? Plan out the meals for all the 7 days, stock your pantry accordingly and get ready to lose a few pounds quickly.